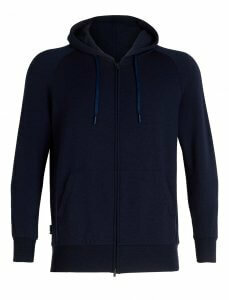 Hoodies have got a recent surge in popularity and are a wardrobe essential going way beyond sportswear. They can look very stylish if you choose a good fit, opting for higher quality materials such as merino wool. 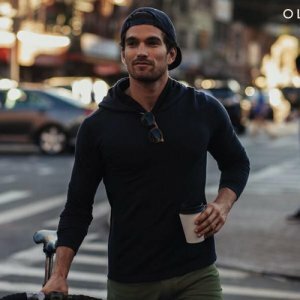 Merino hoodies tend to be slim-fit, rather than oversized which can make them look professional enough to wear to the office if paired with a dress merino wool pants or over a short merino wool dress. Don’t let you full by the minimalist aspect of what seems a “simple” hoodie at a first glance. Yes, it is high price tag. And yes, the quality matches it. Thomas has it in deep black which gives a look both chic and casual. It’s a hoodie he can actually wear in the office, which in my books makes it the perfect street wear. Icebreaker is one of the safest choice in the merino wool world and that is a relevant factor considering the price tag attached to a hoodie. 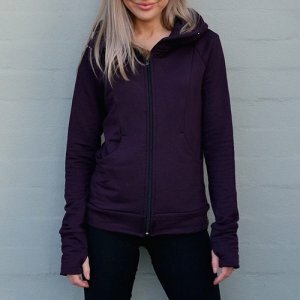 This hoodie is a good all purpose jacket: perfect pre- and post-training layer, can be worn for cold mornings outside, sunny afternoon hikes, cozied up by the fire, from September to May! Care: machine washable in cold water. Do not tumble dry. 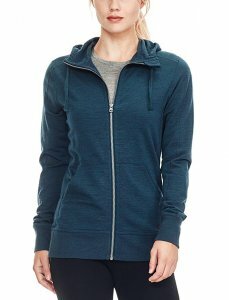 The Icebreaker RealFLEECE collection brings a bit more chic so this hoodie has a lifestyle finish allowing to be worn for other activity such as travel of on the way to work. The touch of Lycra helps for shape retention. We love the fact that it exists in various color options. Here are a couple of things to consider when choosing your merino wool hoodie. Below you will find a short list of good alternatives to our top pick above. The number one reason than merino wool is a superior material for clothing wear is the fact that it stops the growth of odour-causing bacteria. But the reason it is particularly good for hoodies, is that it is awesome for layering. While hoodie falls under the category of outerwear, merino wool hoodies tend to be fitted as opposite to loose. You can be warm in Winter while feeling comfortable under your jacket, as opposed of feeling like a bulky snowman. In summary, merino wool hoodie are lightweight, warm, and just as comfortable as your favourite sweatshirt—but gives you a put-together look. Merino wool clothing are often associated with a number ranging from 140 to 320. This is the weight of the wool in grams/square centimeter. 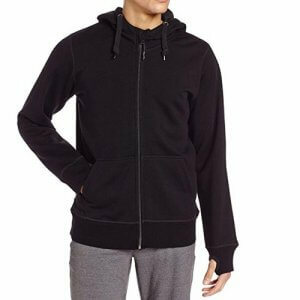 Hoodies are typically classified as what we call “outer wear” or “mid layer”. While t-shirts typically range from 140 to 200 g/m2, you would want to get a 360 to 400 for clothing you would be wearing in the Winter. 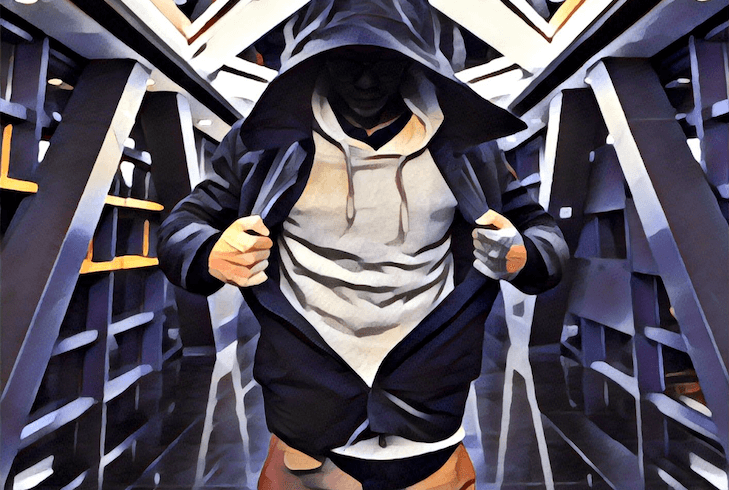 Because they have a heavier grammage per square meter, hoodies tend to be less fragile than thin merino wool t-shirts. 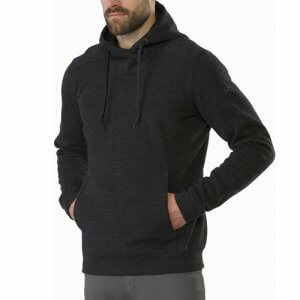 It means it is safer to go for a 100% merino wool fabric for a hoodie than for a t-shirt, for example. Note that some brands still choose to add a touch of lycra especially around the cuff or the hip waist for a tighter fit and more stylish cut. 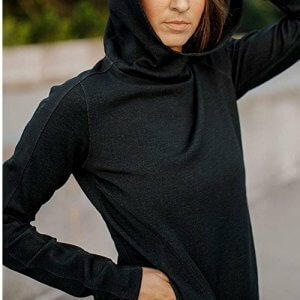 The hood: to keep your post-sweat hair under wraps. They can have drawcord to adjust it which can be useful when cycling in windy weather condition or keep your head warm when your hear are wet such after your swimming training session. 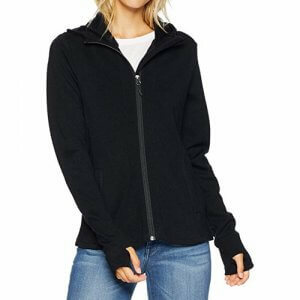 Thumbholes: they tend to make a hoodie look more sporty but thumbholes help keep your sleeves in place and your hands warm. Kangaroo pocket(s): after the hoodie, pockets that join are the biggest garnement feature that differentiate a hoodie from a sweater. They work great as a hand warmer when there are no thumbholes and generally bring a real cozy factor. Zip: Zips in hoodies are very common. They make layering easier, putting it on and off simpler when the weather swings between Summer and Autumn temperatures. They allow for some body temperature regulation, because you can leave them unzipped in warmer weather, zip them half-way in moderate climes or zip it all the way up when it gets colder. Merino wool hoodies can be expensive. This is because the base material – merino wool – is more expensive than cotton because like all our favourite organic things, merino wool grows really slowly. Obviously, you do want make sure your hoodie stays in tip-top condition. All the options listed below can be safely machine washed because we believe in convenience even though a hoodie doesn’t need to be wash as often as underwear! So you want to be mindful of that. Hanging merino wool clothes into the fresh air can sometimes be as good as washing it. It is true anti-stink magic! Note that it is actually best to wash the garment after wearing it a couple of time to remove any short fibers from the fabric in order to avoid future pilling. Don’t forget: Ensure all zippers are closed. Be sure to not put it in the drier as you want to be careful about the shape. It is typically best to lay your merino wool flat to air dry. This is particularly true for hoodies as they are heavier than a t-shirt for exemple. Hanging them could result into bad form share as all the water would pile at the bottom. Feature: No zip but a hidden zippered pocket is located on one side to securely carry your wallet, keys, or phone. Best for: urban style, cycling to the office. Exists in blue. Feature: No zip. Loose fit cut. Kangaroo pockets. Exists in black and grey. Feature: hood, zip, to help keep your hands warm and your sleeves down for easy layering. Plus points: If you like thumbholes, this WoolX hoodie is a great alternative to our Icebreaker top pick. The black makes for a more dressed sweater. Features: a double thickness hood to feel extra snuggy (yet not adjustable), a high quality YKK zipper, thumbholes to help keep your hands warm and your sleeves down for easy layering. Machine washable in cold water. Do not tumble dry. Just as comfortable as your favourite sweatshirt—but gives you a put-together look! It is the thickest hoodie of our list of recommendation list. Cut: Relaxed fit and hip length to layers easily and gives you room to breathe. Exist in black. Cut: loose fit. Craving casual comfort? You’ll love cozying up in this stretchy hooded pullover. Exist in black and blue.